Hello Flores Komodo Liveaboard will take you to faraway lands that seems to fall from heaven itself. Flores island & Komodo island are separated by the Flores Sea, and between them lies a string of islets, each is blessed with breathtaking landscapes. With over 18,000 islands, Indonesia is the biggest archipelago in the world. Cruising on a traditional Indonesian Phinisi is a great way to discover the wonderful treasures Flores has to offer. Hello Flores features the best and safest boats. Taking a Komodo cruise is the only option to get around and relish every beauty lies in between Flores and Komodo. Get more authentic sailing experience by cruising in a modern take of Indonesian Phinisi, the greatest way to wander around the archipelago and embark on a Flores exploration. Flores calls for the true adventurers. Join Hello Flores Komodo liveaboard to taste the salty winds and discover the wonderful Flores. Choose your boat that fit your trip plan and budget. Ready to go? Join Hello Flores on a journey to unspoiled nature through the Flores Sea. Sail from Labuan Bajo to Komodo National Park & have islands galore in between. You can spend up to a week sailing around the archipelago, exploring every place & underwater that spark your interest. This is a trip to exotic places you might never hear of & only accessible through a Komodo boat trip. Flores & Komodo National Park hid unspoiled treasures, where lost wanderers and nature lovers will instantly feel right at home. For days, you will be surrounded by nothing but the sky and the sea, and occasionally pass some islands which look like they just rise from the blueness of the ocean. During the Komodo boat excursion, you will join the dolphin and manta rays crossing the open sea. You will watch as lush green islands rose from the indigo waters while basking in sunlight at the deck of your cruise and slowly slide past by as your Komodo liveaboard drive to your destination. Finding the best tour company for your travel buddy during Flores Komodo excursion is the most important thing before embarking on a journey. Nobody wants to have a week of island hopping in a shady boat and cramped cabin, dealing with seasickness and minimum comforts. Surely you don’t want to be tricked by pushy company and get less than what you pay. 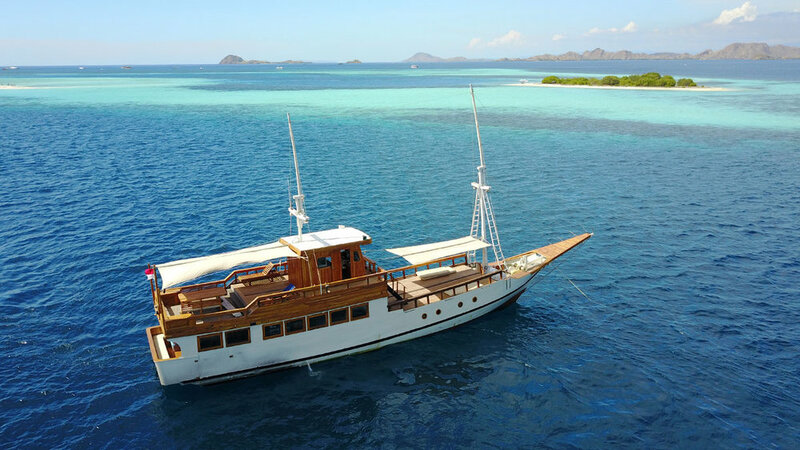 Hello Flores features the best and safest boat for a very versatile, luxury liveaboard Komodo where you can book it online and tailor the journey according to your budget and interest. A thrilling trip to the lair of Komodo island and massive bat island at once? A day full underwater exploration at Manta Point and numerous other diving spots ? Or three day sailing full of savannah trekking and coastal leisure at countless beautiful beaches? Everything is up to you. It’s highly recommended to clear up your schedule for three days to a week upon your arrival to Flores. Your Komodo cruise will launch from Labuan Bajo’s port and it generally takes between 2-3 days to get around the National Park and get the most of the trip. You can make a stop to tourist sites along the way, take occasional dive or snorkel while the ship passes a good diving point, and watch the islands come and pass as you relax beneath the canopy of your deck. Hello Flores want you to enjoy your journey to the fullest. Let’s sail with the best Komodo Liveaboard and let you get gently rolled by the waves in your comfy cabin until we arrive at your destination. Contact our team via email or Whatsapp with your details (number of persons, dates…), we will send you within 24hours an offer with options of boats according to your needs and your budget. The slice of heaven is rarely featured on most holiday-makers bucket list, and that’s what makes this trip even better. Though it’s just 90 minutes flight from Denpasar, Flores is totally a world away from Bali’s wild night parties and celebrated coastal lifestyle. The wilderness of nature is the only wild thing you will find here. Flores and the islands of Komodo National Park are dominantly occupied by green grasses, savannah, and lounging trees. Miles and miles of rolling hills are only split by a single highway, running from the western end to eastern end of the island with few cars passing by. Modernisation even seems to shy away at most of the surrounding island, leaving them totally bare and wild with only trekking trails runs along the wavy terrain. A journey with Komodo Liveaboard is hard to be described by words alone. Indonesia is rarely the same, and Flores will show you how it really means. Tropical jungle stretched across the mainland where it peaked on volcanic mountains of Kelimutu and Inerie mountains, resembling Indonesian landscape in general. However, tucked in the eastern part of Indonesia, some of the islands are among the driest part of Indonesian archipelago. And it turns the over one-meter-high grass into gorgeous auburn path, which is more vibrant during the dry season. Beyond the crisp savannah, pristine beaches ringed the islands. You might expect soft and white, sugary beaches, but the Komodo’s pink beaches are the real game changer. Colored beaches are rare beauty of the earth, and it’s one of the only seven beaches on the island. With this kind of varied, distinct topography, Flores will definitely take you to the other side of Indonesia. Almost like a secret island that no one knows about. Idyllic and unspoiled, Flores and the surrounding islands looks like a slice of paradise that just fall from the sky itself. This is a gateway to remote adventure, a digital detox from your busy life. Without an internet connection, nothing will distract you from the stunning surrounding. Trekking, swimming, snorkeling, and immortalize the stunning landscape in your digital device will keep you busy for days - no need for internet check-in. You gonna find yourself between the winds and swinging meadow with only few tourists around. Outside the mainland Flores, some island is totally unpopulated while some others are just inhabited by 2,000 thousand people, living side by side with the notorious Komodo Dragon who roams freely in their protected sanctuaries. This is where you can taste the Indonesian version of the wild west in its pure, unadulterated nature. The adventure of your Komodo Cruise doesn’t end once you come ashore. Rising to fame thanks to the Komodo Dragon, Flores and the Komodo National Park has become an increasingly must-go destination for true travelers, especially those who want a little escape from the hustle and bustle of neighboring Bali. This is where the islands are ruled by high and undulating hills, the sun shines brightly almost throughout the year, and its tranquil waters gently lap more than 20 string of coastline of the isles. This means a lot of shores to explore on your Komodo tours, featuring picture-perfect hilly terrain overlooking the blue ocean and cluster of islets, sugary beaches, mangroves, lush slopes, and brownish dry grassland. Komodo National Park is the most popular spot to dock. The park consist of three major islands which are equally famous; Komodo island, Rinca island, and Padar Island. These islands are the only places on earth where Komodo Dragons roam freely between the bushes and sunbathing on its shores. They share the islands with deer, wild buffalos, horses, wild boars, and other wildlife—some are their prey. This is where you can have live encounter with the largest reptile in the world, guided by professional rangers. Aside from the wildlife, the national park will also entertain you with outstanding landscapes. The Padar island is home of the notorious four deep bays, multi-colored beaches. And yes, that includes the most-awaited pink beach. Around the east of Flores, several small islands rose within reach to each other. The twin Sebayur islands, Siaba, Gili Lawa Darat, Kalong, and Kelor are to just name a few. Most of the islands offers open landscape with fantastic trek that can supply your social media feed for a lifetime! Some of the islands offer snorkeling opportunity just a few meters off the shore, with rich corals to greet you. The sight can get more dramatic as you slide to the underwater world from the Pink beach, as you will see the baby pink sandy beach trails down to the seabed. Healthy Foraminifera—red coral reef—lining up at the shallow water, and you will know how the Pink beach got its name. If you are thinking that Komodo National Park is the only place to find wildlife adventure, look no further than Kalong island. The island is almost entirely covered with mangroves—so thick you almost cannot see the land. And hanging from the treetops are thousands of bats, undisturbed by the eye of curious travelers. The Komodo cruise cannot dock to this island, but the captain will try to get you as close as possible to the massive, mangrove-build cave if you wish to have a closer look to this wonderful creature. This small and mysterious island reveal its magic near the dusk, when the bats rush to fly from their home and chattering under the violet sky, looking for its food at the neighbouring islands. Don’t worry, they are not interested to your blood—fruits are more appealing to these wild flying foxes. Some fly to Flores just for the Komodo Dragon, but the true traveler knows that exploring the less-discovered islands in between are the true travel gem. It’s a loss to just pass by the islands without taking time to venture on its wonders. Have you ever go on sailing? Whether you are an experienced sea voyager or a first-timer ship passenger, you gonna love what you feel on Komodo Liveaboard. From the lively Labuan Bajo port in Flores, to the pristine Padar island, the romantic pink beaches, and the thrilling Komodo Island, a Komodo sailing trip has something to surprise and delight voyagers of all ages. Sailing with Komodo Liveaboard across the Flores Sea will bind you to brush on new experience at every turn. The open sea offers you certain sort of tranquility that you will not find on land. Under the billowing sails, you are surrounded by nothing but miles and miles of open sea which meet the blue sky far at the edge. To see the crews manage the ships with their agile moves and quick hands will evoke memories when enormous ships were once king of the waves. The wind was caught in the sails, moving your ship to the distant shore. Today, adventure and leisure come together at the deck of Hello Flores Komodo Liveaboard. While you are waiting for what the next island has in store for you, the seasoned sailors as the ship crew will stay at your disposal to ensure your voyaging experience more enjoyable. You can rely on the cruise director to make the most of your trip. At some ships, they will also be your diving buddy to explore the richness of Flores’ underwater world! When the ship reaches one of Flores and Komodo’s diving spots, you can jump directly from the deck to marvel at the underwater wonder. Take as many time as you wish to swim with school of fishes, admiring the lively coral garden, looking for turtles and dolphins, or waiting for Manta Rays to pass by at the Manta Point. Climb back to the ship where delicious dishes and refreshing cocktails are waiting for you. As part of Lesser Sunda Island archipelago, Flores and Komodo National Park enjoys the warmth of tropical climate where the water is relatively warm. It’s pleasant for any water activities as the temperature ranging from 29ªC (84ªF) to 27ªC (81ªF) throughout the year. Conditions during dry season are perfect with warm, sunny weather and calm seas. Divers and snorkelers will also love to sail with lots of great opportunity to dip into the warm water. Flores and Komodo National Park are blessed with not only one, but lots of world-class diving points throughout the waters which will rewards you with one of the best snorkel and diving you’ve ever experienced. Komodo National Park is surrounded by one of the richest marine biodiversity on the planet, a paradise for divers indeed. The water is turbulent and teeming with unparalleled marine life. Luckily, your Komodo diving liveaboard comes with diving instructor and range of water equipment. From snorkeling equipment to kayak, your water vacation at the liveaboard will never get boring. On a day when you are not busy roaming the world beneath the waves, sink in the loungers and bean bags at the upper deck, while the sun swept your face and the taste of salty sea lingers on your lips. Immerse yourself in scenic coastline while waiting for the ship to harbor on the next destination. It’s time to say a momentary goodbye to the solid lands and welcoming the floating life. For few days ahead, the Komodo boat will be your home. Think of it as staying in one exclusive floating hotel. In Hello Flores, we make sure that leaving the home land doesn’t necessarily mean leaving creature comforts behind. We gather the best ship of all budget in Labuan Bajo and make sure to scrutinise their quality. Because only the best Liveaboard Labuan Bajo can match the wonderful experience that Komodo National Park brings to us. The islands may lack of creature comfort, but ill-fitting accommodation is far from all Hello Flores’ collection of Komodo boat charter. Affordable luxury is what Hello Flores bring on board, where aesthetic interiors, comfy lounge, resort-standard bedroom and professional hospitality become the main elements of the liveaboard. Never think about standard make shift dorm-on-deck featuring rolled mattresses that normally present in Komodo budget liveaboard. These boats will give you a nicely themed, cosy cabins where you can comfortably throw yourself between the rigorous hike and daring dive. Komodo Liveaboard by Hello Flores are the embodiment of beauty and comfort you would wish to find in any hotel—only that it offers more. Your boat charter Komodo will be your vessel, floating resort, daily restaurant, spa lounge, and even a diving centre at once. The boats are embodiment of beauty and comfort you would wish to find in any accommodation option. Only, this one is moving, giving you a stunning display of constantly changing scenery every single hours, and taking you into places you never know before. Bathroom business is not an issue. Most of our boat charter Komodo features ensuite cabin which means you will have a bathroom privacy on each cabin. Expect to find a regular bathroom just like back in the land with perfectly functioning showers, flush toilets, and stack of tissues. Whether you are planning for a shared slots for a backpacking ope trip or looking for a Komodo yacht charter for an exclusive trip with family/ closest friends, Hello Flores is your answer. The best time to sail to Flores and Komodo National Park is during the dry season which lasts from the May to August. The rainy season usually falls on December to March, sometimes accompanied by thunderstorms. Clearly not advisable to enjoy a good sail as the sea can be rough, the wind too strong, and the showering rain prevents the scenic landscape to appear. You will have the independence and flexibility to design your Labuan Bajo tours itinerary. Pack your schedule with colorful beaches galore, walk the tracks to the undulating hills, or submerge in every corner of coral garden, create your own personal stops to make the experience your own. And that means you can completely make a Komodo Liveaboard budget sailing trip if you are quite tight in cash but still want to venture into the wilderness of Flores and Komodo National Park. 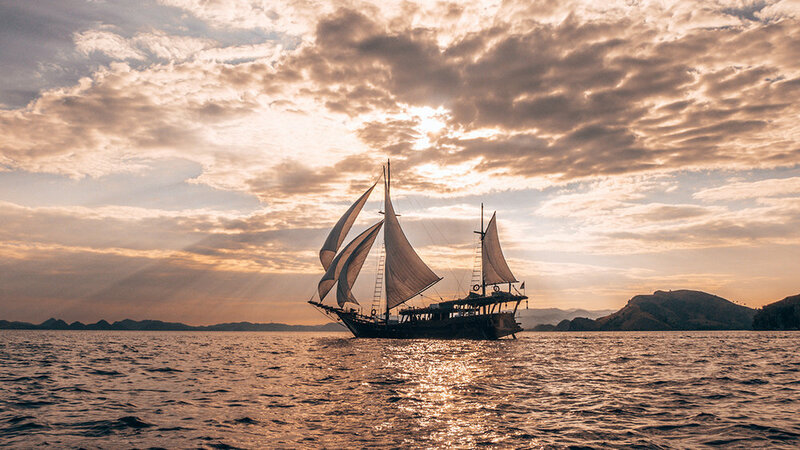 Hundreds of years ago, brave Indonesian sailors used to embark on long voyages with their remarkable phinisi, a traditional two-masted sailing ship. Today, Hello Flores translate the tradition into contemporary Komodo cruise which will suit a Komodo sailing trip in the most authentic way. A journey to discover the unknown doesn’t have to be rough. 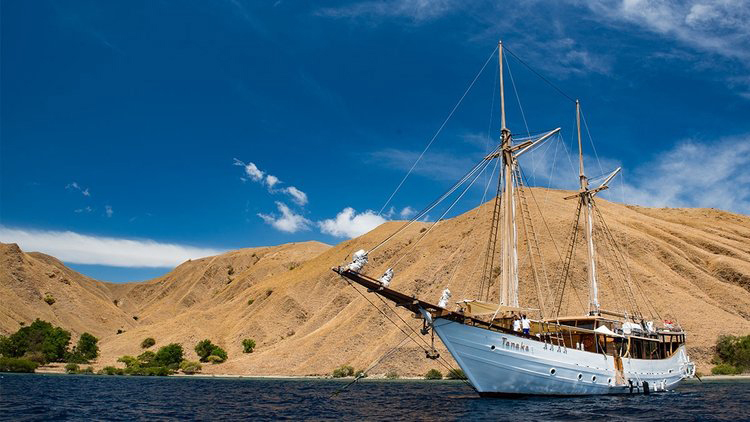 Venturing the sea with Komodo Liveaboard, you will find the perfect balance between thrilling adventure of revealing nature’s hidden beauty, a touch of classic sailing tradition, with prime facilities and convenience. The islands may lack of creature comfort, but ill-fitting accommodation is far from Hello Flores Komodo Liveaboard. Affordable luxury is what Hello Flores bring on board, where aesthetic interiors, comfy lounge, resort-standard bedroom and professional hospitality become the main elements of the liveaboard. Though lounging in the deck is perfect, sometimes the sun can be quite strong when you were in the middle of vast water. Seek refuge to the air-conditioned cabins or indoor decks when the heat is too unbearable. Relish in delicious dishes in indoor dining area at the deck, where panoramic outdoor and stunning landscapes surrounding the ship will be your dining companion. The ship’s talented chef will prepare you amazing dishes, a fusion of Asian and Western cuisine that will stir your appetite, even for the most seasick person in the ship. Hello Flores has a number of Komodo cruises Labuan Bajo in various size and capacity, but their spirits remain the same; they are the finest, most modern cruise in the island. 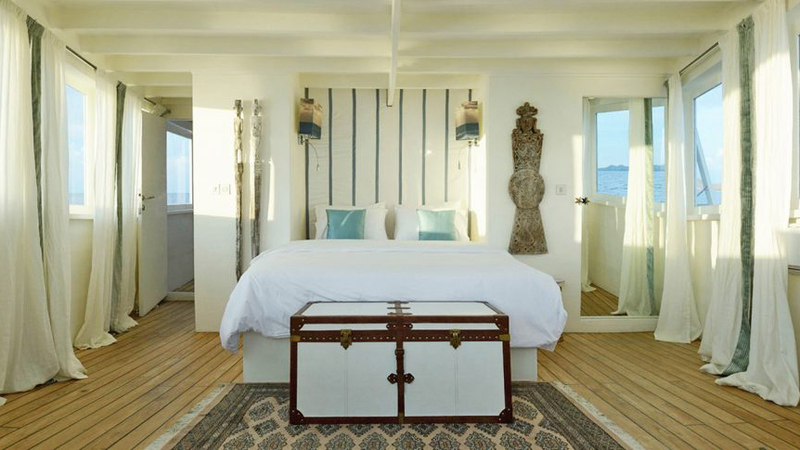 Komodo Liveaboard by Hello Flores is the embodiment of beauty and comfort you would wish to find in any hotel. Only, this one is moving and giving you different stunning scenery every day, every hour, and get you into places you never know before. Its beauty is only beaten by the natural landscape. A Labuan Bajo tours with Hello Flores will not only take you into places; it takes you back to the era when great boat used to rule the world. All of the ships use the strongest tropical woods with attentive details and elegant design which will amaze you with the quality of the work. 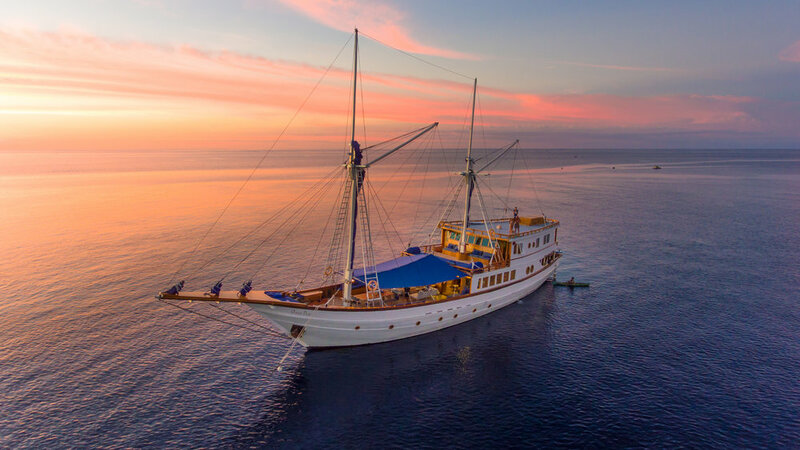 At Mantra, Kelana, and Sipulian 2, teak woods dominate the liveaboard, rolling in thick ambiance of Indonesian maritime heritage in a modern adaptation. Embarking on a voyage means you leave your comfort zone behind the shore and adapt to a totally new living space—the sea. Space and luxury stay is what you really need during a long voyage. Vast living area is the best remedy for a living in the sea, and you can find it best in our Maki and Kelana. Vast amount of space gives you enjoyable trip with group or family outings. There are plenty of rooms in the deck to share for a lively chat with your travel buddies. Refreshing cocktails are available to accompany your stories during the relaxing hours. Some of the spacious cabins even feature additional single beds aside the main double, where the little ones can rest comfortably. The more, the merrier! A Komodo tours honeymoon journey to the secluded islands cannot be more romantic with the ultimate couple-goals boat, Alexa. Draping sheer curtain, white-themed boats, and modern look will indulge you and your loved ones with pure pleasure of simple living in the liveaboard. An adventure between the islands can easily shift into romantic voyages. It’s easy to feel like you are in the middle of blissful ocean, listening to the snap of canvas in stiff breeze, and the slap of waves against the bows. Though luxury is the middle name of Hello Flores’s Komodo cruise, budget travelers won’t need to shy away from the enjoyment of cruising through virgin islets of Flores and Komodo National Park. Choices for Komodo Liveaboard budget is always available for travelers with tight financial plan. Without sacrificing the luxury, Royal Fortuna and Maki are build with great comfort in mind. Though the boats are smaller in than other, you can always enjoy spacious cabin and living area during the long journey to the scattered paradise.